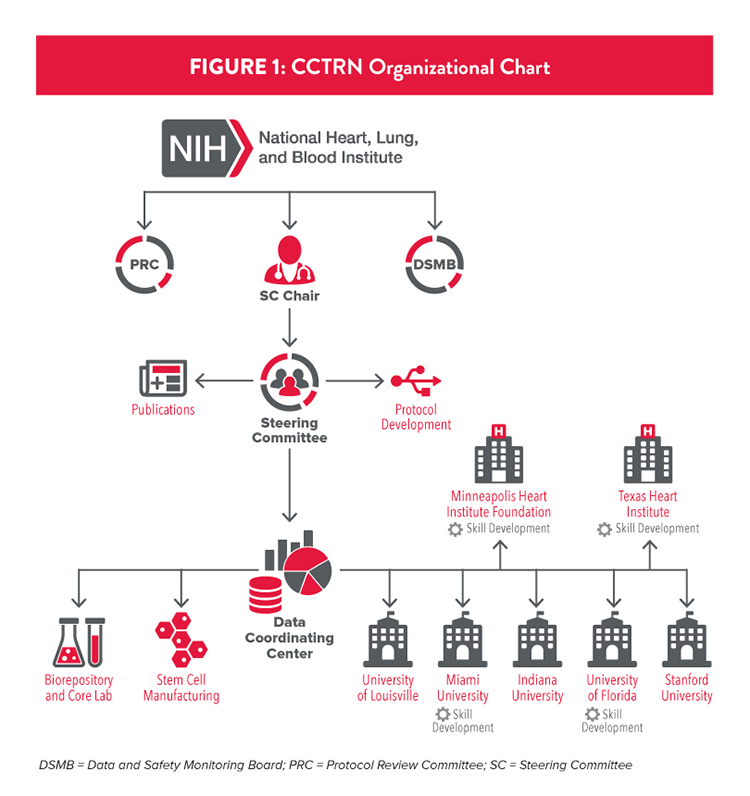 Launched in 2007 by the National Heart, Lung, and Blood Institute (NHLBI), the Cardiovascular Cell Therapy Research Network (CCTRN) aims to achieve public health advances for the treatment of cardiovascular diseases through the conduct and dissemination of collaborative research leading to evidence-based treatment options and improved outcome for patients with heart disease.1 The CCTRN is a network of physicians, scientists, and support staff (see Figure 1) dedicated to studying stem cell therapy for treating heart disease. Traditionally, cell therapy trials for cardiovascular disease are complex trials requiring experienced and well-trained clinical research nurse coordinators (CRNCs). Hiring and retaining experienced CRNCs across multicenter, multiyear clinical trials can be challenging. It is worth noting that the average tenure in a job setting for a research coordinator working in the United States is between one and three years.2 This high turnover rate is resource intensive in terms of recruitment, onboarding, and training. Recognizing this as an opportunity for improvement, the NHLBI issued a request for training program proposals as part of the competitive grant renewal for the CCTRN in 2012. NHLBI awarded the Minneapolis Heart Institute Foundation (MHIF) and the Texas Heart Institute (THI) funding to train CRNCs. The MHIF training program consisted of moderated and self-paced online training components that were provided in addition to its established, preceptor-based orientation program. THI’s training program followed a more traditional pathway, with each clinical research nurse training onsite for 16 months with a structured preceptorship taught by the members of the research team. Develop a core curriculum consisting of didactic, hands-on training, multimedia/virtual support, and, most importantly, a mentoring program during the first 12 months of the grant period. Train four or five research nurse coordinators yearly in conjunction with the CCTRN clinical research activities during the grant award period. The curriculum for the training program (see Figure 2) was delivered in a variety of media formats that included interactive classroom, taped or linked video presentations, live and remote presentations, and moderated slide presentations. The curriculum also contained a repository of relevant peer-reviewed articles. For the online instruction component described below, quizzes followed each module to assess the coordinator’s retention of the presented material. Research coordinators accessed the modules of interest to them when it worked with their schedule, making this a very convenient resource. For the online component of the training program, MHIF used the Udemy online learning platform to enhance its existing orientation and training program. A unique feature of this platform was that it provided a technology solution for experts of any kind to create courses that could be offered to the public, either at no charge or for a fee. Use of the platform was intuitive, and required minimal technical skills for program setup. The course content created could be adapted for training in clinical research networks, customized to disease-specific training, and used across different research departments of health systems. Additionally, from a cost perspective, the online learning platform was a good match for this program since the pricing structure could be adjusted as the training program expanded. Converting traditional research nurse training materials into moderated slide presentations required a great deal of up-front effort and time. Slides and scripts were created from existing materials and reviewed for accuracy, completeness, and user comprehension. Once the materials were converted, they were easily accessible, easily updated, and “green” because preceptors did not need to print materials for new employees. Importantly, because the field of stem cell research is evolving, it was necessary that presentations be easily modifiable. Each module contained a disclaimer stating that the creators had made reasonable efforts to ensure that the information presented was accurate at the time of publication. The goal of THI’s Clinical Research Nurse Training Core Program was to provide a training environment in the Stem Cell Center at THI in which nurse participants developed the comprehensive skills and research competencies necessary to become independent CRNCs in cardiovascular stem cell research. Training emphasized the care of subjects in clinical stem cell studies; solving problems that arose regarding the logistics of coordinating these trials; ensuring data accuracy; and adherence to established clinical research standards, regulatory guidelines, ethical principles, competency, and protection of human research subjects. THI’s program used a variety of methods to educate trainees, consisting of individualized mentoring, didactic classes, hands-on training, and web-based training modules. The participants for this nursing skills program were registered nurses new to clinical research with less than one year of clinical research coordination experience and without previous cardiovascular cell therapy research knowledge. The participants held a minimum of two years of clinical work experience (preferably working in a cardiovascular intensive care unit, critical care unit, or catheterization lab). This program was a 16-month training core. In 2014, the strengths of both sites were capitalized upon to create a joint CRNC training skills development program to better serve the needs of nurse coordinators throughout the CCTRN. The goal of the THI/MHIF collaboration was to maintain an effective and user-friendly way to train coordinators and disseminate the most up-to-date information, to be accomplished by creating self-paced modules for disseminating best practices for coordinators in stem cell research. Training was geared toward new CRNCs, but also offered an opportunity for experienced nurse coordinators to expand their knowledge base. Furthermore, the initial intended audience comprised CCTRN nurse coordinators, but there were non-nurse coordinators at participating sites who also expressed interest in the training opportunity. The two groups developed modules that were comprehensive (covering cardiovascular, clinical research processes, and stem cells), convenient (content could be accessed as needed on multiple devices), and adaptable (content was applicable to other studies and other disease processes, and could be modified as scientific breakthroughs occured). Figure 3 lists the main topics of the CCTRN modules. Content for both the initial MHIF and the combined training programs was created with contributions from the investigators and coordinators at MHIF, THI, and other CCTRN sites. The pool of experience about cell therapy research from these individuals greatly enhanced the quality of the training modules. The modules covered the basics of a study coordinator’s roles in subject recruitment and consent, staff education, and regulatory compliance. The content addressed many stem cell topics, including cell harvest, processing, transportation, and delivery. The coursework offered a basic cardiovascular anatomy and physiology module for those coordinators who needed a refresher in these areas. The modules trained study coordinators through recorded lectures, videos, links to additional resources that supported the topic, and self-assessment quizzes. Each module had a consistent overall format, and as professional trainees have limited time, the modules were developed in segments usually lasting no more than 15minutes. Preceptor contact information was provided so that the trainees could submit follow-up questions, as needed. Trainees also had multiple opportunities (i.e., at the end of each module) to provide feedback to the preceptors so the site could be continually improved. Key advantages of the online learning platform were seen from how it supplemented the sites’ own onboarding programs, reduced training time for new coordinators, and enabled all users to access and learn at their own pace and convenience. 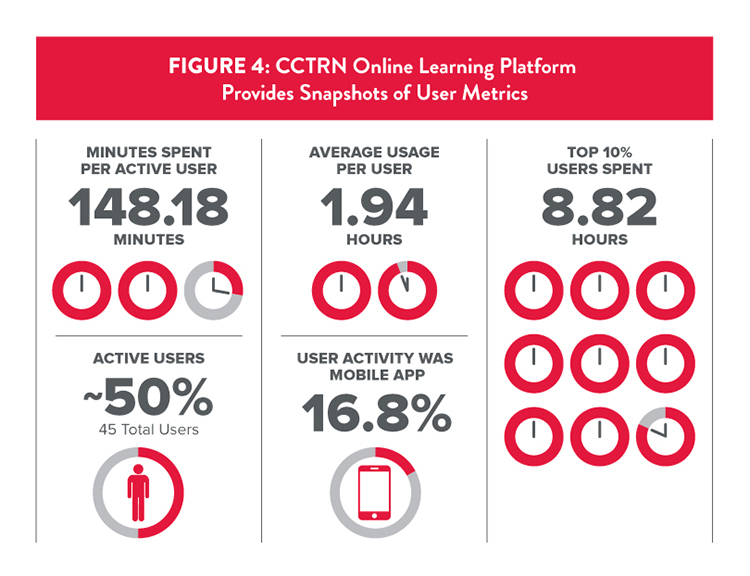 Further, the online learning platform provided analytics insights so preceptors could ascertain who was using the training site and which content they viewed. Tracking the site’s user analytics helped the team improve the site and track usage trends, as displayed below (see Figure 4) in a sample snapshot report from the CCTRN online training platform’s analytics dashboard. In addition to developing the CCTRN training modules, the THI/MHIF team wanted to offer further incentives for participation to the coordinators. In Spring of 2015, the team approached the Association of Clinical Research Professionals (ACRP) to request a certificate of completion from a recognized organization for the learner’s or trainee’s completion of activities. ACRP indicated that it had worked with organizations in the past on these types of requests and was interested in working with the team. ACRP requested the modules be grouped together in 45-minute to one-hour segments due to their varying timeframes. After months of discussions and collaboration, ACRP approved the module content and translated the activity into contact hour points for the users’ recertification needs. ACRP determined that, upon completion of the approved training modules (see Figure 5), an ACRP certificant would be able to self-report the continuing education contact hours on applications for maintenance of ACRP’s CCRC®, CCRA®, or CPI® certification designations. ACRP will continue to review and evaluate any new content added to the CCTRN’s online learning platform. To provide a mechanism for the learner and/or trainee to document module completion and receive the contact hours, the MHIF team created a survey/feedback section. Once the curriculum was completed, an automated e-mail message notified the MHIF team for training completion verification and certificate issuance. In Spring 2017, the CCTRN launched the ACRP CCRC maintenance credit opportunity for the CCTRN THI/MHIF modules for all of the coordinators within the network. More than 80 coordinators have used the CCTRN MHIF/THI training core modules to date, and an increase in the number of users is expected. As of December 2017, MHIF’s CCCT has trained 20 clinical research coordinators over a five-year period, including the recently completed cohorts, which included non-nurse research coordinators. For the first time, the type of trainees were expanded to include associate research coordinators and research assistants. These groups expressed keen interest in completing the moderated and self-paced programs and were great addition to the training cohort. The faculty will further customize the program to ensure that scopes of practice are clearly delineated. Of the CRCs who underwent training, 10 are working at MHIF as independent CRNCs, and 10 others left to pursue opportunities in clinical research as coordinators or research management in academic and cardiovascular health industry settings. THI’s 16-month training core program has trained a total of three coordinators, two of whom have continued in the field of clinical research. The fourth trainee started THI’s training core program in April 2017. The trainee who did not continue in clinical research decided to return to bedside nursing, with a particular interest in the care of patients who received stem cell therapy. Individualizing the training core program at THI to the trainee’s learning needs was the most beneficial aspect of the program, as each participant learned differently. It was also noted that not all participants will want to continue in research due to personal professional preferences. Ensuring that the end-user interface was user-friendly was essential for the training program’s success; users had varied online access experience. The interface needed to be easy, convenient, and intuitive for all. Further, our early online content tended to come in the form of longer presentations that users did not finish in one sitting. By breaking these and future presentations into 10-to-15 minute blocks, we increased utilization and completion of modules. Analytics showed access to the program peaked during the mid-week and around mid-day. Finally, providing ACRP certification credits has been very positive and has increased utilization. To date, nine research coordinators have completed the certificate eligible modules, with more coordinators being expected to utilize the program for certification maintenance credits. In addition to continuing to support the training needs of CCTRN, it is envisioned that the online training site will expand to include other NHLBI networks and external research networks. The goal is to eventually provide an accessible resource for the general clinical research community. We are carefully considering charging nominal fees for site access outside CCTRN to ensure sustainability of the program beyond the grant period. Support for these learning modules is made possible through the National Heart, Lung, and Blood Institute (NHLBI) (awards HL087394 and HL087365) in conjunction with the Cardiovascular Cell Therapy Research Network (HL087318). Simari RD, Moyé LA, Skarlatos SI, Ellis SG, Zhao DX, Willerson JT, Henry TD, Pepine CJ. 2010. Development of a network to test strategies in cardiovascular cell delivery: the NHLBI-sponsored Cardiovascular Cell Therapy Research Network (CCTRN). J Cardiovasc Transl Res 3:30–6. Speicher LA, Fromell G, Avery S, Brassil D, Carlson L, Stevens E, Toms M. 2012. The critical need for academic health centers to assess the training, support, and career development requirements of clinical research coordinators: recommendations from the Clinical and Translational Science Award Research Coordinator Taskforce. Clin Transl Sci 5:470–5. Joseph Cosico, MA, CCRC, (joseph.cosico@cshs.org) of Cedars-Sinai Heart Institute. Jennifer Chambers, RN, BSN, CCRC, (jchambers@texasheart.org) of Texas Heart Institute. Rachel Olson, RN, BSN, MBA, (rachel.olson@comcast.com) of Duke Clinical Research Institute and consultant with Minneapolis Heart Institute Foundation. 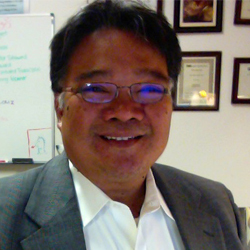 Gerry Yumul, RN, (gerrydesign@gmail.com) of Paradigm Education Solutions and consultant with Minneapolis Heart Institute Foundation. Jay H. Traverse, MD, (jay.traverse@allina.com) of Minneapolis Heart Institute Foundation. Emerson C. Perin, MD, PhD, (eperin@texasheart.org) of Texas Heart Institute. Timothy D. Henry, MD, (timothy.henry@cshs.org) of Cedars-Sinai Heart Institute.